Not only physical objects, but also electromagnetic fields can exhibit chiral properties. This chiral nature of light leads to chiral interactions between such fields and chiral media. The results of these interactions depend on the mutual handedness of the field and the medium. Therefore, such interactions are the basis of chiroptical spectroscopy. In this chapter, we introduce optical chirality as a measure for the chiral interaction strength of electromagnetic fields. For this purpose, we derive the excitation rate of a chiral molecule in dependence of the optical chirality of the external electromagnetic field. Subsequently, we analyze the optical chirality of different field distributions and introduce the concept of chiral plasmonic near-field sources, which are metallic nanostructures designed to provide strong optical chirality in their near-fields. Additional design criteria that should be fulfilled by the near-field distribution occur, if these near-field sources are intended for highly sensitive enantiomer discrimination. 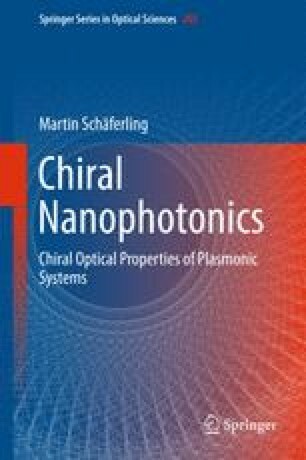 Furthermore, we motivate that not only the nanostructure, but also the illumination must be considered to characterize a chiral plasmonic near-field source.